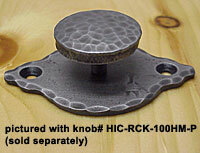 Hacienda Iron Craft offers a variety of choices for cabinet knobs and pulls with the handcrafted touch. This pewter backplate is no exception. When combined with the knobs from Hacienda, it contributes a warm, pastoral effect to todays supple cabinetry designs. The cabinet hardware from Hacienda is put through the same meticulous process as door and bath hardware, protected by an advanced acrylic sealant and baked twice for maximum finish protection.